How do some animals locate the source of a sound? Locating a source of a sound for many animals is a major necessity—not only for hunting food, but also to avoid becoming prey themselves. For example, cats (and many other animals) have extremely keen hearing, not only in terms of frequency range, but the way they locate a source of sound. One way they determine a sound source is called the interaural time difference (ITD)—the difference in arrival time of a sound wave between a cat’s two ears. The cat uses ITD to localize the origin of the sound, but because they have symmetrically placed ears, determining a source may be more difficult, since each ear is about the same height and distance from the nose as the other. To compensate, cats will often tilt their head, altering the position of the ears relative to the origin of the sound, which helps to better localize the sound’s origin as the sound waves reach the ears at different times. 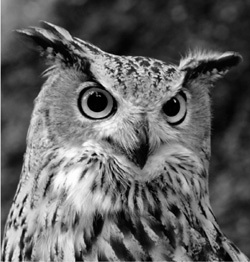 Of course, one of the top hunters of the animal world is the owl. They are also one of the best “listeners” and are extremely accurate when locating the source of sound (mostly prey). The asymmetrical location of their ears help them to hear better, with one ear further forward on the head than the other ear. In addition, owls have good eyesight—one of the largest binocular fields of vision in the animal world—with the tilting and bobbing often seen in an owl allowing it to better see, judge the position of, and hunt its prey. The owl’s unique anatomy greatly enhances its ability to quickly locate prey.